One sports a fire helmet, another a revolutionary bonnet, yet another a costume crown. They come from factories or the French heartland, or from the high schools of Paris. Weekend after weekend, thousands have poured into Paris to vent their anger at a government seen as coddling the elite. But each is individual, and many make personal statements through the accessories they wear. For Lara, 45, that's her vivid red hat evoking Marianne, a symbol of the French Republic and the overthrow of the monarchy. For retiree Daniel it's a crown and a skeleton face mask, with a French tricolor flag draped over his yellow vest. Jean-Michel, 66, painted his blood type — O positive — on his forehead in blood-red paint, to protest what many see as a heavy-handed police response to sometimes violent protest. Roger and Marc, also in their 60s, wear goggles to protect from the tear gas. More than 2,000 people have been injured since the movement began Nov. 17, mostly protesters but also many police, and journalists too. All of the protesters spoke only on condition that their surnames not be used. Some feared repercussions at work for their activism; others that their names would be associated with the extremist side of the movement. Engineer Theo, 27, came from the Alps to march in Paris, a fire helmet perched on his head with a cardboard sign expressing his anger at the European Union, dictatorship and President Emmanuel Macron. Former soldier Christophe proudly wears his medals and blue beret. A simple neon headband, adorned with a heart, makes the point for personal care worker Cecile. Some have a specific grievance, most often the rising cost of fuel. That hits hardest on the working class in the provinces who need their cars to get to school, work, the doctor, the supermarket. Older generations are angry at a new tax on pensions. Others come out of curiosity, or general discontent that life in France hasn't been as comfortable as they thought it would be. 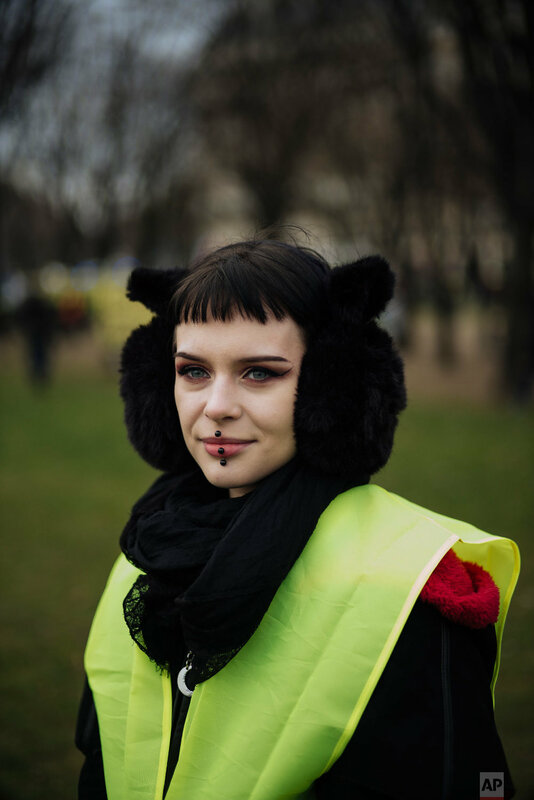 Magali came from the Mediterranean island of Corsica with a "mandate" from some 100 yellow vest protesters at home who are bitter at the central government but couldn't afford to travel to the capital. She waves a Corsican flag. Young people enthusiastically join the ranks. 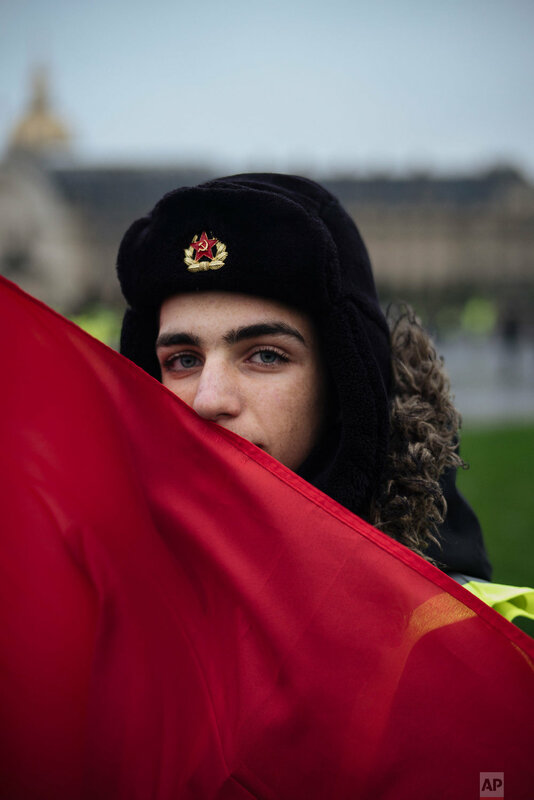 Rafael, 17, marches in a Russian-style fur hat with a hammer-and-sickle sign. Real estate negotiator Marine, 26, goofs around in peace-sign glasses alongside her 19-year-old student sister Fanny. A playfulness sometimes mixes with the anger, like in the bright yellow ribbons springing out of secretary Valerie's hair, or the yellow mimosas carried by Audrey, a production line conductor from the northern city of Lille, punctuating the gray sky.